South and North Korea are set to hold their first high-level military talks in more than 10 years Thursday to discuss ways to ease cross-border tensions. The meeting will be held on the northern side of the truce village of Panmunjom from 10 a.m., according to Seoul's defense ministry. It will be the first such talks since they met last in December 2007. 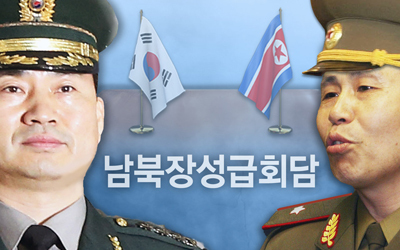 South Korea's five-member delegation will be led by Major General Kim Do-gyun. The North's delegation will be led by Lieutenant General An Ik-san, who will be accompanied by four other officials. "(We) plan to discuss such issues as easing military tensions between the two Koreas and arranging a defense ministerial meeting as part of efforts to implement what was agreed upon in the military sector under the Panmunjom Declaration," Kim told reporters before leaving for the talks. The Panmunjom Declaration refers to the April 27 inter-Korean summit agreement, which included the two sides' commitment to joint efforts to ease military tensions and "practically eliminate the danger of war." The general-grade talks are expected to focus on discussing the restoration of a cross-border military communication line, holding military talks on a regular basis and establishing a hotline between their military leaders. The two sides could also discuss the recovery of the remains of fallen soldiers in the Demilitarized Zone that bisects the two Koreas. South Korean President Moon Jae-in recently promised to push for this amid improving ties with North Korea. During Tuesday's summit in Singapore, U.S. President Donald Trump and North Korean leader Kim Jong-un agreed to cooperate on recovering the remains of American soldiers killed or who went missing during the Korean War. Experts say that the North could possibly bring up the issue of halting joint military drills between South Korea and the U.S., as Trump said he would halt "expensive and provocative" joint war games with South Korea after his summit.